I’ve been using electric toothbrushes since I was 14, when I had braces fitted, as I was told by my orthodontist they were best to avoid discolouration once I had my braces removed. I’ve recently upgraded to the Oral-B Pro 2500 Toothbrush, which I was sent by Pure Smiles. First of all, this toothbrush is pink! I’ve been using Oral-B for years and I’ve only ever had the baby blue and white standard version. Despite best efforts not to get muddled up, when more than one person has this toothbrush in your home, you’re going to get mixed up. You can add a different coloured band to the heads, but if you’re half asleep when you brush them like I do, then you may use the wrong one. My gorgeous shiny new pink version means no more mix ups! If pink isn’t your thing, you’ll be pleased to know that this version is also available in black. I can over brush my teeth, by pressing too hard on my gums and have been told to be careful by my dentist. 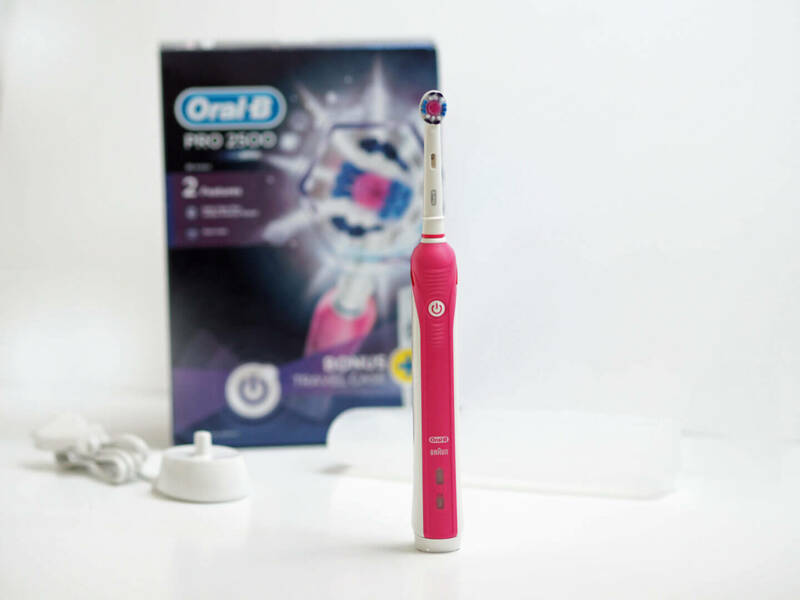 One of the best features of this toothbrush is the pressure sensor which is built in. 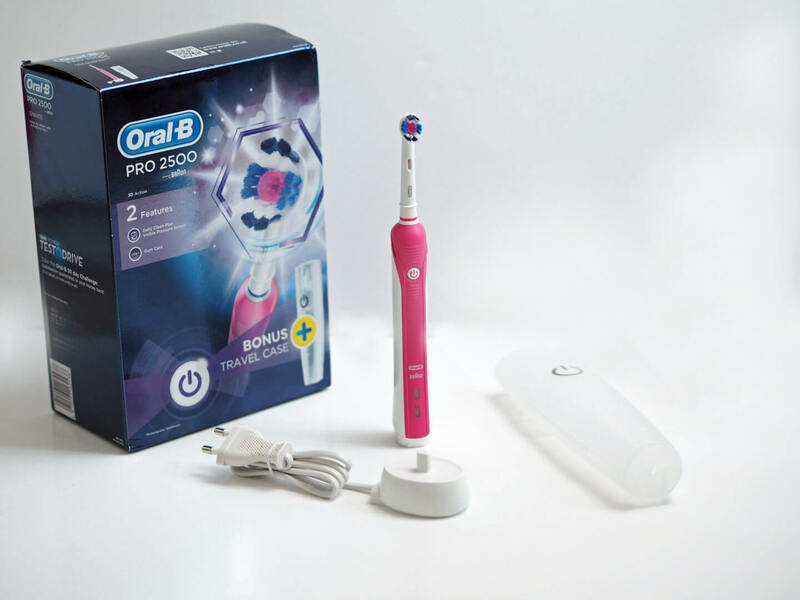 The Oral-B Pro 2500 Toothbrush lights up red if you apply too much pressure. Oral-B recommend brushing your teeth for 2 minutes, breaking down your teeth into four quadrants, and to spend 30 seconds on each. The handle vibrates to let you know 30 seconds has elapsed and it’s time to move on. The toothbrush charge should last one week brushing twice a day for two minutes. It’s really easy to charge too, you just put the toothbrush on the charging unit, plug it in and leave it. The brush flashes with a yellow light as it is charging, and a constant light shows to tell you it is fully charged. The Oral-B Pro 2500 Toothbrush also comes with a travel case making it easier for packing (I hate wet toiletry bags). 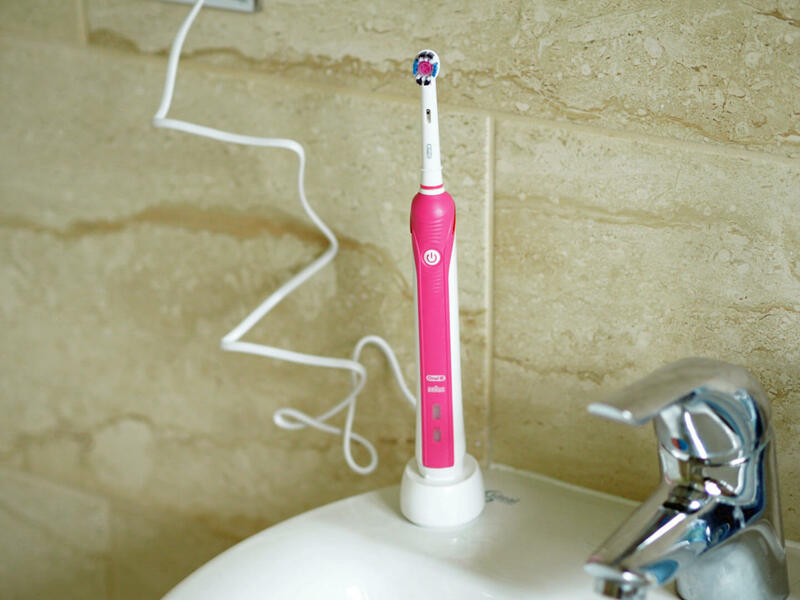 Do you use an electric toothbrush? I now have my other half and dad using one and they really do make such a difference. I was sent this toothbrush in exchange for review, however all opinions are my own. I used to have one of these as well, so handy! It looks perfect! Thanks for sharing! I’ve never had an electric toothbrush but have always wanted one and especially now I feel like it would be really good for my teeth if I did. Love the colour of this!